Is your dog’s stride no longer as confident? Is his muzzle slowly graying? Does he sleep more than he used to? Is his energy lower? If the answer to those questions is ‘Yes,’ then your pet may be getting old. Even though you can’t reverse his aging, with a simple change in diet, you can make your dog’s elderly years almost as comfortable as his adulthood. How Important Is a Special Diet for Your Aging Dog? What Health Problems Can Affect Your Dog’s Diet? What Makes the Perfect Food Your Old Dog? The choice of the best food for your aging dog is not as easy, though. There are problems they may encounter, and disease they may develop. This guide aims to help you get through this challenge and ensure your canine companion lives a long, fulfilling life. CANIDAE’s PURE Meadow is the best choice for your aging pooch. It consists of a low number of ingredients, main of which is chicken, and it is free of grain, which should help with your senior pet’s sensitive stomach. Along with those, it also contains whole grains, making it that much easier for your pet to digest. The formula also includes vitamins, minerals, and probiotics to help your pet’s digestive tract. It is free of gluten, antibiotics, hormones, corn, or soy, so it’s safe for canines with allergies. Although elders are the intended audience, it can also help doggies approaching old age, as it gives them all they need to maintain their youthful energy just a little longer. This is overall the best package both for dogs in their elderly years and those soon-to-be seniors. It is appropriate for small, medium, and large breeds alike. Even though smaller breeds tend to age slower, when they do reach their advanced years, they will need the extra help this formula can provide. Hill’s Science’s Diet Adult 11+ recipe is specially catered to small or toy breed seniors’ specific needs. It is based on chicken for the high-quality protein your senior pooch needs to maintain its lean muscles. It also contains with whole grain along with fibers, antioxidants, and fatty acids, all to help your pet’s immune system, and to bolster its skin and coat along with keeping its digestion healthy. Produced from natural and quality ingredients, it is also free of artificial colors, flavors, or preservatives, and should be safe for your aging pet’s digestion, as well as for dogs with allergies. So, when your small pooch finally approaches his senior years, this is the formula we recommend for him. It will give him all he needs to remain healthy and full of energy despite his advancing age. As your pooch gets older, he may display changes in his fur or skin. His coat may lose some shine, and his skin may become darker or thicker. Fortunately, you can remedy all those problems with a simple change in his diet. Diamond Naturals’ Senior Formula provides just such a regime. It is rich in all the vitamins, minerals, and omega-3 and omega-6 fatty acids your pooch needs to maintain the health of their coat and skin throughout their golden years. Along with a chicken base as a source of proteins, and whole grains to help with the digestion, this formula also contains fruits and vegetables, such as coconut, blueberries, peas, and kale. At the same time, it does not contain preservatives, artificial colors, or flavors. It even includes glucosamine and chondroitin to help with your aging pup’s joints. This food is the best overall choice if your doggie develops problems with his skin or coat in his old age. It should restore the shine of his coat, and the health of his skin, and at the same time, provide all he needs from a balanced daily diet. Along with old age, dogs can develop problems with their load-bearing joints and hips. Even if your pet develops arthritis, he can still benefit from a diet rich in glucosamine and chondroitin, which can help preserve your pup’s aging joints. Blue Buffalo’s Life Protection line of products contains such a formula. Their chicken and brown rice senior recipe is ideal for older canines with arthritis or joint problems. Those two ingredients will help your pooch maintain higher levels of mobility in their senior years. Based on deboned chicken to help your pup’s muscles, it also includes whole grains, fruits, and vegetables. It is also higher in carbohydrates, giving your aging puppy a little more energy. And as it doesn’t contain corn, wheat, or soy, it shouldn’t give your pooch any digestive problems. To support the aging body of your pet, this food also includes LifeSource Bits, dry kibble mixing antioxidants, vitamins, and minerals. All these nutrients make this formula our recommendation for pups with joint problems, pains, or arthritis. While it won’t cure those diseases completely, it will give a welcome relief, and your aging pooch will rediscover his lost mobility. 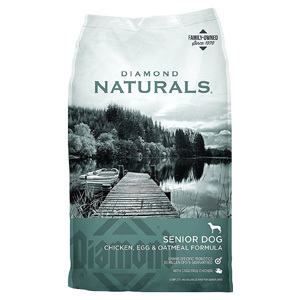 Among a wide range of dry mature dog food, Holistic Select’s Senior Health recipe with chicken meal and lentils is our choice. Its mix of chicken and lentils provides health and energy, and it also helps with slower metabolic rates that come with age, while helping your pet maintain weight. It’s a mix of select fruits and vegetables, such as pumpkin or papaya, and full of fiber to help sustain the health of the digestive system. The diet also includes glucosamine to alleviate the aging puppy’s painful joints and hips, helping them to achieve higher mobility. It also includes a source of microorganisms usually found in healthy digestive tracts, which helps keep their digestion moving when they need it most. For dogs that prefer dry food, we recommend this formula. It contains all the ingredients your canine elder needs for a healthy life, while also helping his digestion absorb the most nutrients it can. As your beloved pet gets older, his weight may begin to fluctuate. If he spends most of his days sleeping, he is likely to gain weight. If, however, his appetite worsens, he may begin to lose mass. This is where AvoDerm Natural’s Senior Chicken Meal & Brown rice formula comes in. Its recipe is based on chicken, which provides all the protein your aging pooch needs. It also contains chicken cartilages, a natural source of glucosamine, which helps with their aging joints. Along with that, the food is rich in whole grain, namely, brown rice and oatmeal, and it also contains fruits and vegetables, all to help your aging pet’s increased need for minerals, vitamins, and fiber. Should your elderly dog’s weight start to fluctuate, this formula is our recommendation. It provides a nourishing and balanced diet for seniors, and it should help your pet maintain a healthy weight. If your elderly pet doesn’t have any problems with his metabolism, or you are looking for a generally well-balanced diet that gives your doggie all they need, Wellness Complete Health’s senior recipe based on deboned chicken and barley is our choice. Its primary ingredient, deboned chicken, should provide all the protein your elder needs, while whole grains help with digestion. It also contains all the vitamins, minerals, fat, and carbohydrates your hound needs, while also having fewer calories to help maintain your pet’s weight despite his slower metabolism. It also includes glucosamine and chondroitin to help maintain your senior canine’s joints well into its old age. This formula provides a balanced daily diet appropriate for older canines, while also supplying them with all the nutrients they need to remain healthy and energetic in their senior years. Should your aging pooch prefer canned food, we recommend Nutro Ultra’s Senior Chunks in Gravy Canned. And even if your dog likes dry food, you can safely use this formula as a kibble topper. After all, it contains everything your pet’s aging metabolism needs to maintain a healthy lifestyle in their golden years. The proteins in this recipe come from three sources—chicken, lamb, and salmon—providing the increased protein your senior pup needs, while whole grains ensure proper functioning of their digestive tract. The formula also contains natural sources of glucosamine and chondroitin to help maintain the health of your pet’s load-bearing joints and hips. It is also rich in omega fatty acids, helping ensure your doggie’s coat remains healthy despite his advanced age. Because of all that, this formula is our choice among a variety of canned food brands. So, if your elder prefers wet food, this recipe will give him all he needs, while keeping him active and vigorous. Proud owners of a larger breed may need to find a formula that caters to their specific needs when their beloved pet reaches their old age. 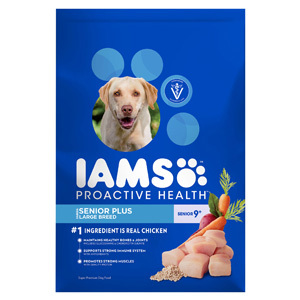 Iams ProActive’s Health is our choice in this category because it provides all the nutrition your four-legged friend needs to live a dignified life in his senior years. Based on chicken as the source of protein, this recipe also contains whole grain for energy and health, while also including antioxidants to help boost your aging pooch’s immunity, and it contains glucosamine and chondroitin to help their aging joints and hips. It is also free of artificial colorings, flavors, or preservatives, ensuring your pup’s sensitive senior stomach won’t be upset by this formula. With this recipe, your large canine companion will maintain his youthful enthusiasm in his old age. And as they usually grow older more rapidly than smaller breeds, it may become necessary sooner than you think. As dogs get older, it is highly likely they will start to put on weight. When that happens, it is time to find a diet made specifically for that problem. Victor’s Senior recipe is our choice among food that encourages weight loss. The formula is still rich in protein, as an elderly pooch needs more protein than their younger fellows, but it has fewer carbohydrates and calories for the reduced energy consumption of his slowing metabolism. Along with that, this food also contains all the vitamins, minerals, and fiber your aging pup needs to maintain the health of their immune and digestive systems. It also doesn’t have any artificial coloring, flavor, or preservatives, so it doesn’t strain your dog’s elderly digestion. Overall, this recipe should provide a perfectly balanced daily diet for your elderly pooch, and its high-protein formula ensures his aging metabolism has everything it requires. Its lower caloric value is at the same time perfect for seniors who gain weight. A typical canine metabolism will change with age. It will start to slow as your pet approaches elderly years, and maintaining his usual diet can lead to weight gain. That gain can, in turn, lead to more serious diseases, like diabetes, arthritis, and heart condition. In that case, your pet needs a diet low in carbohydrates and calories. Your dog may also begin to lose weight if his appetite decreases. In that case, a simple change in his diet may be all that’s needed. Recent studies also show that senior dogs need more protein to help with regeneration. If you’re interested in purchasing protein-rich dog food our review guide should help you. Also, they need more fiber in their diet to ensure the health of their digestive tract. Around the middle of their life expectancy, dogs enter their senior years. Where they were full of energy earlier, now they sleep the days away. Their muzzle shows their first gray hairs, their pace may become less energetic. Those are all normal signs your dog is getting old. Older canines may gradually lose their sight, and it is a normal sign of growing old. The loss may be an effect of degenerative changes in the eyes, or they may develop cataracts. The degenerative changes are irreversible, unfortunately. Despite that, your vet may recommend a diet of beta-carotene and docosahexaenoic acid, which may slow the process and allow your pooch to enjoy his sight a little longer. Dementia, or cognitive disorder syndrome, is a disease like dementia and Alzheimer’s Disease in humans. Your pooch’s behavior changes, their sleeping patterns shift, they forget all they learned, or they forget the people in their lives, causing them to become more aggressive. If your pet starts displaying such behavior, you should consult your vet. Along with that, there are supplements which may ease the problem, specifically vitamins A and E, beta carotene, and L-carnitine. With advanced age, your pet may experience problems with his kidneys. As these organs normally clear waste, when they fail, that waste will build up. Unfortunately, there is no cure for kidney failure, and the sooner you or your vet catch the symptoms, the higher the chances your dog has of a longer life. After consulting your vet, you can attempt to ease the stress on the failing kidneys with a good renal diet, consisting of lower doses of high-quality proteins, lower quantities of phosphorus, and higher amounts of moisture. Canned food would be the best option. The most common gum problem, gingivitis, is an inflammation of your pooch’s gums. If not treated, it can lead to more serious problems, like periodontitis, where gums start to withdraw from the teeth, leading to a loss of bone tissue. Even though there is no cure, a diet rich in calcium can ease the problem. Also, foods with lower quantities of carbohydrates can help, as they reduce the amount of energy the germs get. Like arthritis in humans, canine version can include symptoms like inflammation of load-bearing joints (legs and feet), as well as their reduced mobility and range. Canine osteoarthritis is a progressive disease, meaning it only gets worse, and there is no cure. Despite that, supplements or food rich in chondroitin and glucosamine can help alleviate the symptoms, according to a recent study. As in humans, the chances of getting cancer increase with age. The symptoms vary with the type of cancer, so we recommend regular checkups for aging puppies. If your dog is getting treatment for cancer, their tissue needs regeneration, and thus, their diet should be rich in protein and fat and low in grain. Like in humans, the cause of canine diabetes is the body’s inability to produce insulin, leading to glucose build-up in their bloodstream. Unlike humans, however, you cannot treat canine diabetes with insulin shots. Instead, you must rely on a dietary regime to manage symptoms. This primarily means their diet needs to have fewer carbohydrates, as they metabolize to glucose. Food rich in fiber can also help, as can food that has a slower absorption rate, as that can reduce the spikes of sugar levels. Search for more relevant food for diabetic dogs here. Dogs can develop heart problems as they age, just like humans. If left untreated, heart problems can lead to congestive heart failure, the heart’s inability to pump blood to the rest of the body. Once diagnosed, your vet will give you instructions on maintaining a diet through your pet’s recovery. Usually, that means low-sodium dog food to prevent fluid build-up. Food supplements also help, particularly vitamin B, taurine, or carnitine. While some dogs can continue eating their normal food well into their advanced years, most need some degree of modification in their diet. As dogs get older, their energy levels and their metabolic rates decrease. That can lead to weight problems, which can lead to other, more serious diseases. This guide is meant to help you with the choice of diet for your aging puppy to make sure they continue to lead a healthy life despite their advanced years. The amount of protein is the main difference between normal and senior dog food, as your pup’s aging body needs more protein to help maintain their health. There can also be a difference in fat. If your pooch is losing weight, you could try a regime with more fat, while dogs struggling with obesity should maintain a low-fat, low-carbohydrate diet. Another difference is in the calorie density. As older canines are less active, they generally need fewer calories. However, if your pup is losing weight, you may need to switch to a food with higher caloric value. Choosing food for your aging pet can be a daunting task, and in the end, there is no definitive answer. Problems and diseases accompanying old age can also make things more complicated. As such, your dog’s specific needs determine the best food. Before changing your dog’s diet, be sure to consult your veterinarian. After a complete examination, you can see what your dog needs from his nutrition and decide on a regime if one is necessary. The evaluation will also reveal any problems the diet may need to correct or any diseases that may be developing. If your pet has problems with his immune system, he should be on a grain-free diet. In all other cases, however, dog food containing whole grains such as brown rice, oatmeal, or quinoa can be beneficial as a source of amino acids and fiber. They also keep the blood sugar level stable longer. Proteins are even more important to elderly canines. Their need for regeneration increases as more of their tissue gets damaged by the aging process. Proteins help with that need and can slow their decline. Dogs with kidney problems, however, should eat less high-quality proteins, as digesting proteins increases strain on the kidneys. As with humans, certain artificial food additives, preservatives, colorings, or flavors can increase the risk of diseases, especially coupled with your elderly puppy’s sensitive digestive tract. So, just to be safe, stay away from synthetic ingredients and look for food containing natural colors or flavors. With the advancing of years, your pet may display a smaller desire for food. While a certain amount of appetite loss is natural and expected, should your senior pooch start to lose weight, there may be a few strategies that can help return its enthusiasm for food. As long as they don’t include food toxic to dogs, such as onions or garlic, a home-cooked meal may motivate your pup to start eating again. For proteins, you can add chicken, lamb, or fish, and you can mix that up with whole grains, such as brown rice or oatmeal. Try with delicious dehydrated liver treats, follow our homemade recipe, your old fellow will love it. If your pet still doesn’t eat as much, you can add flavor enhancers to your homemade recipes. Those enhancers, however, usually contain artificial ingredients, so use them sparingly and with caution. If all else fails, visit your veterinarian for a full examination. The problem may be more serious if it persists. It may be a symptom of an underlying disease, or, ultimately, it may be a sign his life may be nearing its end. Whichever of those may be, your vet is the person to contact and discuss potential solutions. At what age are dogs considered old? The age at which pooches become elderly varies by breed. As a rule, canines reach their elderly age at half their life expectancy. Larger and heavier canines age faster than smaller breeds. Smaller dogs live anywhere from 15 to 20 years, while larger breeds live from 12 to 15 years. So, bigger pups enter their seniority at the age of six, and smaller around the age of nine. If you’re interested, calculate here how quickly dogs age compared to humane. Is low-sodium dog food recommended? As a rule, dogs don’t get high blood pressure from high sodium the way humans do, and as such, they mostly don’t need sodium-free dog food. There are, however, situations and diseases which affect elderly dogs and which require a low-sodium diet, such as congestive heart condition. In those cases, a veterinarian should determine the amount of sodium appropriate to your dog’s food. What are the signs of nearing death? The most obvious sign that your pooch is at death’s door is its lack of movement. Your pet will mostly lay in a secluded place. Its breathing will be shallow and slower than usual. Its heart-rate will lower. As their final moment approaches, their movements can become staggered or uncoordinated, if they can get up at all. They may lose control over their bladder or digestive tract. In most cases, they will not eat or drink, and changes related to that may be evident on their skin and fur (dry mouth, gums, nose, fur). What else you can expect, when the moment comes, read here. Is it normal for them to sleep all the time? As they reach old age, dogs generally display less energy and spend more time sleeping, even during the day. That daytime sleeping is mostly resting, though. Changes in sleep patterns can be a symptom of cognitive disorder syndrome. However, in that case, dogs change the way they sleep, spending nights awake and sleeping during the days. If your dog shows symptoms associated with cognitive disorder syndrome, consult your veterinarian about further steps. Even though your pet is not as energetic in his mature years, his life doesn’t have to be reduced to sleeping all day and moping around when awake. With a simple tweak of his diet, your pet can once again find the energy he thought he lost. As his metabolism slows, the food you feed your pooch needs to reflect that. And as he isn’t as active as he once was, his diet should contain fewer calories and carbohydrates. His aging body requires more building material to reduce the aging-induced damage, and for that reason, his food should be richer in protein. And barring any diseases, your pooch can, with a proper diet, have a long and fulfilling elderly life.